America's wild burros have played an important role in history, yet today they endure great hardships at the expense of the American taxpayer. Wild burros can survive with little water and low quality vegetation, thriving on brush and tree bark that most animals would turn their nose up to. They are fierce opponents to large predators, standing their ground and fighting back against a coyote or a mountain lion that is threatening. Burro herds are also slower to reproduce during extreme drought. 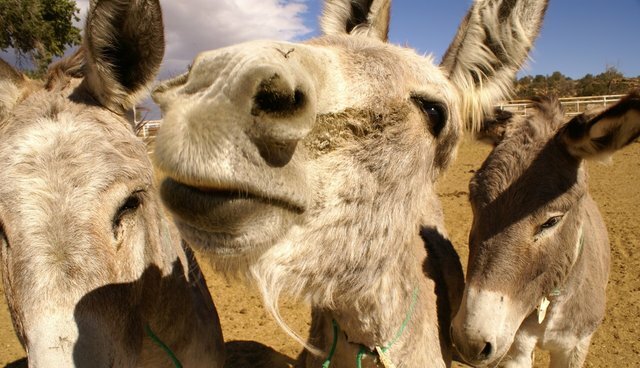 These are just a few of the reasons that burros have become such successful desert inhabitants. These hardy desert survivalists can become too successful and become overpopulated in these barren deserts where water is a precious and necessary resource. Burros were designated by Congress in 1971 as "living symbols of the historic and pioneer spirit of the west" and are protected from illegal capture and torture. Currently the Bureau of Land Management's plan to manage these wild, yet resilient creatures consists of rounding them up in areas deemed overpopulated and adopting the burros out to the public. This approach may have worked for a while, but over the last six years, adoption rates have fallen and there are now 900 burros living in government holding pens - at no small cost to the taxpayer. The Platero Project, a program sponsored by an anonymous donor and managed by The Humane Society of the United States, aims to help reduce the number of burros that need to be removed from the wild by using the fertility control vaccine porcine zona pellucida on female burros. The drug prevents the females from giving birth. PZP is federally registered, widely used by the BLM on wild horses, has been proven safe and effective in field trials. However, the BLM has yet to use this fertility control vaccine on wild burros. By reducing the number of wild burros born on the range, the project could potentially reduce the number of burros that need removed from the wild. The HSUS plans on remotely darting wild burros with PZP and studying its effects in several wild burro herds. In the meantime, The Platero Project hasn't overlooked that there are already over 900 burros in BLM holding pens that need homes. For this reason, the project has started a burro training program that pays trainers to gentle these animals and then find quality homes for them. Burros make great companions as well as excellent livestock guardians, protecting herds of sheep, goats or cows from predators. Over 140 wild burros have found homes through the trainer program in just a year's time. The Platero Project has also helped place nearly 200 burros in sanctuaries across the country. America's wild burros do not deserve to be crammed into government holding pens or worse - captured and shipped to faraway countries to be inhumanely treated or even slaughtered. The BLM needs to look to PZP as a kinder and more fiscally responsible and sustainable approach to managing our wild burros on the range. Heidi Hopkins is the program manager for The Platero Project.